We explain the pitfalls to avoid when transferring projects from other DAWs for mixing in Pro Tools. Pro Tools is the most commonly used DAW for mixing, but as a mix engineer, you are likely to receive sessions and projects that have been created and recorded in other DAWs. So what’s the best way to get them into Pro Tools to start this process? In this month’s Pro Tools workshop article, we’ll start with some general points, then look at specific issues that arise when exporting sessions from Logic Pro and Studio One. The most important thing to do when exporting a project is to make sure everything is properly labelled. This is especially important if the person mixing the session is not the person that tracked it. I have lost count of how many times I have received sessions where the tracks are labelled with the default names like ‘Audio 1’, ‘Audio 2’ and so on. Make sure track names actually describe what is on the track; some are easy, such as ‘Kick’ or ‘Top Snare’, but when it gets to things like synths and samples, you need to be more informative. For example, a track labelled ‘Kontakt 5’ is obviously some kind of Kontakt instrument, but the name gives the mix engineer no idea what that instrument is or how it fits into the song. If the role of the track can’t easily be summarised in its name, make additional notes. Once you’ve exported your project, put everything into a dedicated folder and name that appropriately, too. Include a rough mix if you have one, and as much information as possible, perhaps in a ReadMe text file: project tempo, how any effects that the mix engineer will need to reproduce were created, and so on. It’s usually a good idea to compress this folder to a ZIP archive when sending it, not so much to save download bandwidth as to ensure that nothing can get lost in the process. Before you start exporting, duplicate the original session so that you are working from a copy. In this duplicate session, clean up all the superfluous content that is not used. In general, the simplest way to bring a project from another DAW into Pro tools is to export each track as a WAV audio file. It is best to assume that the mix engineer does not have any of the plug-ins or virtual instruments you do, so any effects or instrument tracks will need to be rendered to audio files. It is usually best to render tracks dry, without the plug-ins that are used in the rough mix, but there may be times where plug-in effects are a key part of a particular sound. In this case I would recommend including processed versions of those tracks as well as the unprocessed versions. 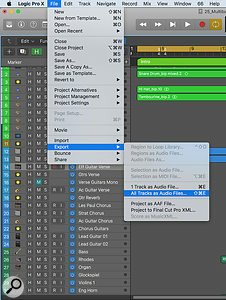 When exporting files to open in Pro Tools, it is essential that each track’s audio file starts at the beginning of the session, even if there isn’t any audio on that track until later in the song. This makes it easy to import the files into Pro Tools: snapping each audio file to the start of the session will ensure they are all in sync. (There is no need for each track’s audio file to be the same length — just make sure they all start at the beginning.) It is best to make sure that you export all the audio files at the same sample rate and bit depth as you used in the source DAW. There is no benefit in exporting the files at a higher sample rate and bit depth. You will just end up with bigger files and no improvement in sound quality. Like most DAWs, Logic has several ways of automatically exporting an entire project as a collection of audio files. These typically use the Logic track names as the basis for the names of the exported files, so make sure that all the tracks are named correctly. Effect returns or subgroups are not normally included, but audio from muted tracks is, so if you have tracks that don’t form part of the project, I recommend that you do a ‘Save As’ in Logic and then delete those muted tracks from the duplicate session before export. Logic Pro X adds the option to switch tracks off using the Track on/off button; tracks that are switched off will not be included in the export. Logic Pro offers several export options; unless you have a lot of experience with AAF files, this is usually the safest choice.For most purposes, the best way to export a Logic project for mixing is to use ‘Export As Audio Files’ from Logic’s File menu. In the submenu, select ‘All Tracks as Audio Files’. 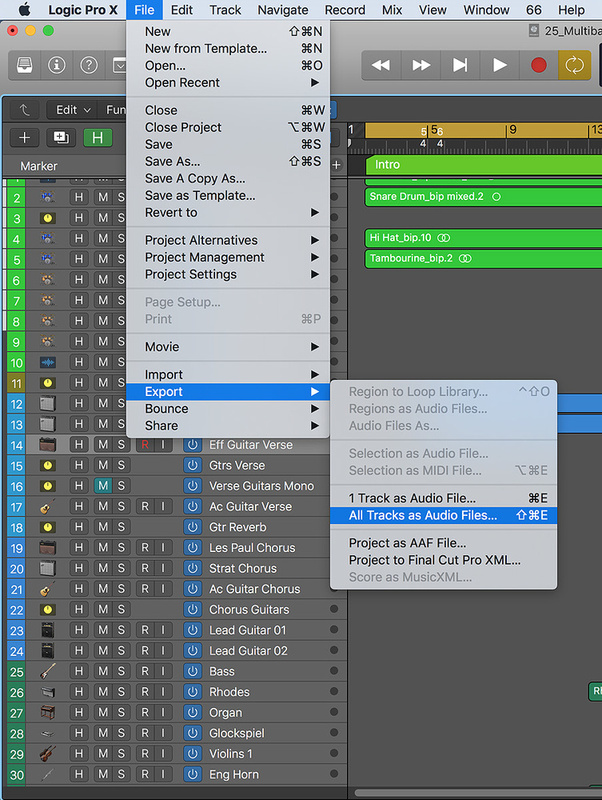 In the Export dialogue box, choose WAVE and the bit depth of the original Logic session. Leave the Normalize option on Overload Protection Only so that you aren’t changing the levels of each track. The Bypass Effect Plug-ins option provides a simple way of ensuring that the export is completely dry; however, if you have effects you want to print, make sure you check the ‘Include Audio Tail’ option, otherwise reverb and delay tails can be cut off. Logic also gives you the option to render the volume and pan automation. My advice is to leave this feature disabled, as the automation will be burnt into the audio files, so can’t be changed or removed. Once you are ready, click on the New Folder button, give the folder a suitable name, and hit the Save button. Logic will create a folder of audio files that all start at bar 1, which will make it reasonably easy to import them into a new Pro Tools session. One of the other options that Logic offers is Export As AAF File. As the name suggests, this exports the Logic session into an AAF-format file that can be opened in a variety of DAWs, including Pro Tools. The advantage of this option is that edits and regions on tracks will be preserved, but it is prone to files being missed out, meaning the Pro Tools user doesn’t end up with everything they need. Another down side is that all your instrument tracks in Logic will not get printed as audio files, so I would recommend that unless you are used to using AAFs, you leave this option alone and just use the Export As Audio Files option. One other tip is to export a single MIDI track that is the same length as your session in Logic and include the session tempo and project markers. Use the ‘Selection as MIDI File’ option in Logic’s Export submenu, but make sure your selection starts at the beginning of the song and finishes at the end of the song. 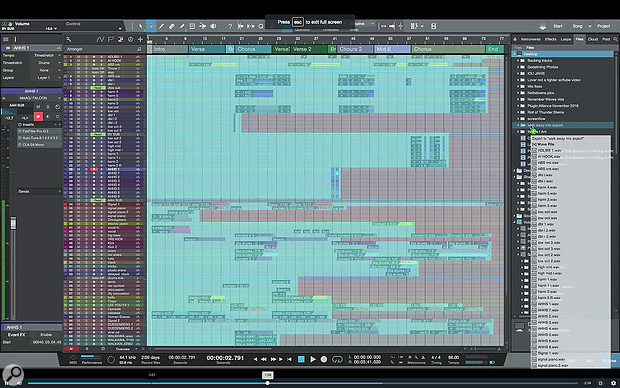 To export a Studio One Song, choose the Range tool and select everything in it. The easiest way to do this is to zoom out so you can see the complete Song, then click and drag from the top right to the bottom left. To export a Studio One project, you can simply drag everything into a folder in the Browser. Next, from the Browser in Studio One, go into the File menu and create and name a folder with the project name. Now simply drag everything that is selected and drop it in the folder in the Studio One browser window. This will export all the raw audio files from that session into that folder. No processing or effects will be applied; if you want to include some processed files, consider doing a selective bounce to create processed versions of any files. Next, you will need to generate audio files from your instrument tracks. Right-click on each instrument track in turn and select ‘Transform to Audio Track’. Choose the appropriate options from the Transform Instrument Track dialogue box, and don’t forget to select Auto Tail to make sure any decays at the end of clips are retained. Once rendered, these files too can be placed in the export folder. In Studio One it is also possible to export your effect return tracks. To do this, open the Export Stems dialogue from the Song menu, de-select all the stems by clicking on the None button at the bottom of the window, and then select only the FX tracks. These will usually be at the bottom of the list. When you click OK, Studio One will bounce all the selected busses and tracks to the session’s Stems folder, from where they can easily be copied to the export folder. Before you import the audio files into Pro Tools, create a new Pro Tools session using the same sample rate and bit depth. A key option that you’ll encounter on importing the files is the choice between Copy or Copy All and Add or Add All. If you choose the former, all the audio files will be copied into the Pro Tools sssion folder; if you use the latter, the session simply refers to the files in their original location. It’s usually not a good idea to have the session and its audio split across multiple locations in this way. If you are offered the third option of Convert or Convert All, it means that the audio files are not in the same format as the Pro Tools session, so you need to delete that session and create one with the right settings. Note that this can happen even if the sample rate and bit depth match, if you haven’t ticked the Interleaved option when you created the new session.